Through IGA Community Chest we’ve raised well over $80m to help local communities. 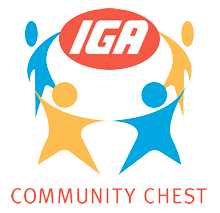 One of the fantastic initiatives championed by IGA is the community chest program. The money is raised in a number of ways but predominately through the purchase of products with an IGA Community Chest logo on the label. If you are a member of a group or aware of a group that you believe could do with our support, please see one of the Store’s team members.